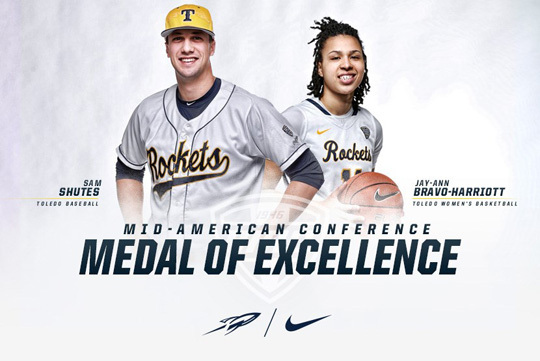 Women’s basketball player Jay-Ann Bravo-Harriott and baseball player Sam Shutes have been selected to receive the Mid-American Conference Medal of Excellence Award. Bravo-Harriott and Shutes have been selected by The University of Toledo to receive this award for their collegiate career in both academics and athletics excellence. Both student-athletes have been successful on the playing field, in the classroom, and proven their excellence through leadership and service. A three-time Academic All-District selection and MAC Distinguished Scholar Athlete, Bravo-Harriott graduated in December with a degree in communication and a minor in general business. She is working on a master’s degree in business administration. Earlier this year, Bravo-Harriott was named to the College Sports Information Directors of America Academic All-America First Team, becoming only the fourth player in school history to earn this prestigious honor and first since Kim Knuth during the 1998-99 campaign. On the court, Bravo-Harriott averaged 12.8 points, 3.5 rebounds, 2.2 assists and 0.6 steals in 29.4 minutes in 2017-18. The two-time team captain started every game this past season, finishing seventh in the MAC in three-point field-goals made (79, 2.4), 10th in three-point field-goal percentage (.376, 79 of 210) and 19th in scoring. The 2017-18 honorable mention All-MAC honoree concluded the year tied for fifth in UT history in three-point field-goals made (79) and tied for seventh in three-point field-goal attempts (210) in the single-season record book. The three-time all-league recipient led the Rockets in scoring eight times, assists on four occasions, steals three times, rebounding twice, and blocked shots once. Bravo-Harriott wrapped up her collegiate career third in school history in three-point field-goals made (245) and three-point field-goal attempts (684). A two-time MAC Distinguished Scholar Athlete and Academic All-MAC honoree, Shutes will graduate this summer with his degree in civil engineering. Shutes recently wrapped up his career with one of the finest seasons ever by a Toledo pitcher. A 2018 First-Team All-MAC selection, he went 10-2 this season with a 2.97 ERA in 97.0 innings. The senior struck out 82 batters and walked just 30. He became the third pitcher in school history with at least 10 wins in a season and led the league in wins and innings pitched. In conference play, Shutes was 7-2 with a 1.96 ERA in a league-high 64.1 innings pitched. Opposing MAC hitters batted just .212 against him. Eight of Shutes’ final 10 starts lasted at least seven innings, and he had five starts with at least six shutout innings. He twice earned MAC Pitcher of the Week honors and MAC Scholar-Athlete of the Week distinctions. On the final day of the regular season, he threw the first complete-game shutout by a Rocket pitcher since 2014, blanking Bowling Green while facing just two batters above the minimum. He also earned National Collegiate Baseball Writers Association National Pitcher of the Week honors after his stellar performance against the Falcons. Shutes leaves Toledo with 309.2 career innings pitched, the third most in school history, and 219 strikeouts, which are fifth most at UT. This season he made 15 starts for the second straight year, becoming the second pitcher in school history to start at least 15 games multiple seasons. This entry was posted on Friday, June 1st, 2018 at 3:01 am and is filed under Athletics, News .